FORT LAUDERDALE, Fla. — The church van packed with children was headed south – with just an hour to go before reaching Walt Disney World – when it got caught in a fiery pileup involving two 18-wheelers that killed seven people, including five of the youngsters. 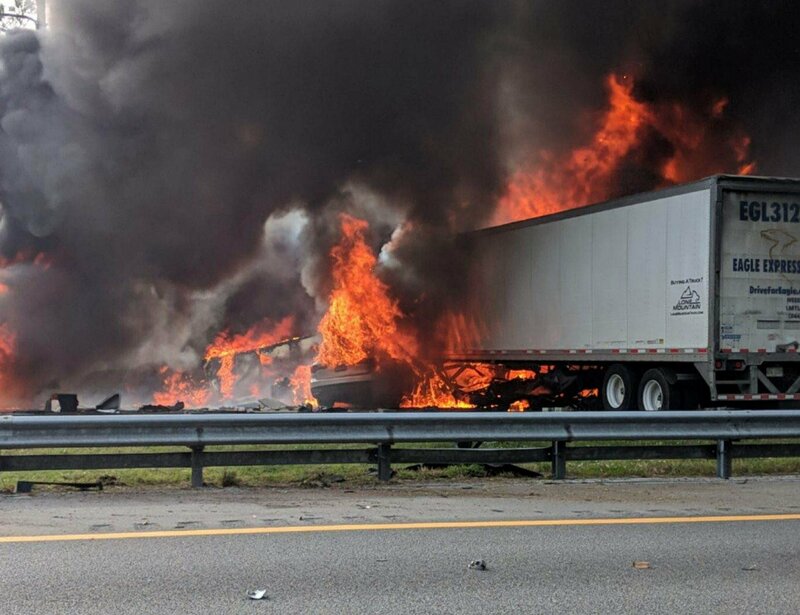 Investigators were trying to determine what triggered the accident Thursday afternoon on Interstate 75 near Gainesville. The Florida Highway Patrol said that two vehicles traveling north – a semitruck and a car – smashed into each other and then burst through a metal guardrail, slamming into the van carrying the children and another semitruck. Diesel fuel leaked and the mass erupted in a fireball. A fifth car, unable to avoid the chaos, sped through, possibly hitting victims ejected from the vehicles, the highway patrol said. Five of the children, ranging from about 8 to teenagers – from a Pentecostal church in Marksville, Louisiana – and the two truck drivers died. At least eight others were injured, some seriously. “It is a heartbreaking event,” Lt. Patrick Riordan said Friday. He did not identify the church involved, but an unnamed volunteer from the Avoyelles House of Mercy church in Marksville and quoted in the Facebook page of U.S. Sen. Bill Cassidy said the congregation lost “half of our babies” in the crash. A pregnant woman who was among those injured delivered a baby, according to a message posted on the Facebook page of the Lighthouse United Pentecostal Church Omaha and signed by Kevin V. Cox, the Pentecostal church’s Louisiana district superintendent. Cox said a van from a Pentecostal church in Marksville, Louisiana, was involved in the crash and identified the church’s pastor as Eric Descant. He said the pastor’s wife was among at least eight people who were injured and that his granddaughter was among the children killed.